Do you know Omurasakishikibu?This scientific name is Callicarpa japonica avar. luxurians Rehd.I like this.Because it bear very beautiful fruit. The height of the tree is around 3 meters from 1 meter.The height of the tree is around 3 meters from 1 meter. The leaf is anti-life in ovoid. The point of the leaf is sharp and is jaggedness. As for the flower, as for the length, around 8 millimeters, flower diameter are around 5 millimeters from 3 millimeters from 5 millimeters with form of pipe. The point of the flower is split in five. There are four stamens. The point of the pistil is flat. I attach spherical stone fruit from 3 millimeters in diameter that I made green after flower arrangement to around 5 millimeters. This is variation of Callicarpa japonica. This plant is distributed from Hokkaido to Kyushu, Ryukyu Islands. Furthermore.This is seen in the forest of the low mountain extremely commonly. It is July from June at the flowering time. 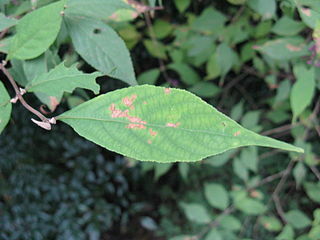 The base of the leaf produces a cyme and touches a flower tinged with white or a light crimson and violet color a lot.It ripens in purple from October through about December. 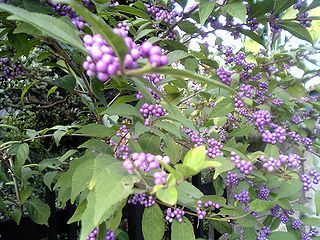 This plant is used as gardening because this plant’s fruit is very beautiful purple. The people cultivate it to appreciate this purple. If you would like to see that,you go to Sukumo, Otsuuki and Ashizuri. It’s beautiful! I want to see it!